It’s been well stated over the past decade or so that society as a whole is at a tipping point when it comes to the environment. It’s important that we all do our part to avert, or at least lessen the impact of, potential changes to our climate. Key to this is energy efficiency, altering the way we use energy to preserve natural resources and reduce carbon emissions. Energy efficiency is particularly important in an industrial context, as the various manufacturing industries contribute significantly to the escalating global warming crisis. Making sure that your manufacturing process is as environmentally friendly as possible has become as vital to operating a factory as following health and safety legislations. Of course, keeping operations as energy efficient as possible also serves industries well financially – by using less energy, companies can save an awful lot of money. Compressed air systems play a large part in the energy costs of a factory. A study by the US Department of Energy puts the approximate figure of electricity consumed by compressed air systems at 10% of a facilities electricity usage, although this figure can be significantly higher depending on how you use your system. Therefore, making sure your air compressor system is as energy efficient as possible is vitally important to both the environment and your accounts. Thankfully, whether you are currently running a system or looking to invest in an entirely new setup, there are a number of ways to make sure your system is as efficient as possible. Like most appliance manufacturers, air compressor manufacturers have made the effort to ensure that their product comply to energy efficiency regulations and standards so, provided you buy from a reputable dealer, you can rest assured that any new equipment will have been manufactured with efficiency in mind. The demand for efficiency has actually led to some neat innovations in air compressors. One of the main new features quite a few compressors now boast is variable speed. This feature controls the speed of the drive motor, meaning you can match power consumption with air demand. Essentially, you can ensure that you’re using the amount of power you need for each particular job rather than sticking to a single, inefficient setting. Variable speed can also be retrofitted into existing systems. When purchasing a new system, proper installation is key to ensuring that the system is as efficient as possible. Improperly installed systems can mean that the equipment you are powering won’t function in the manner it should, wasting you time and money. Make sure you have fully-certified and accredited experts install your system to ensure that it is as efficient as possible. But how do you make an existing system more efficient? Well, the first step is getting a grasp on how much energy your system is using, as well as the equipment making use of the compressed air produced. There are plenty of complex formulas for calculating energy output, but it’s far easier to have professionals come in and give your system a full air compressor energy audit. Ask experts take a thorough look at your system and let you know exactly what needs to be done to make it more efficient. And finally, the most important aspect of energy efficiency – regular maintenance. 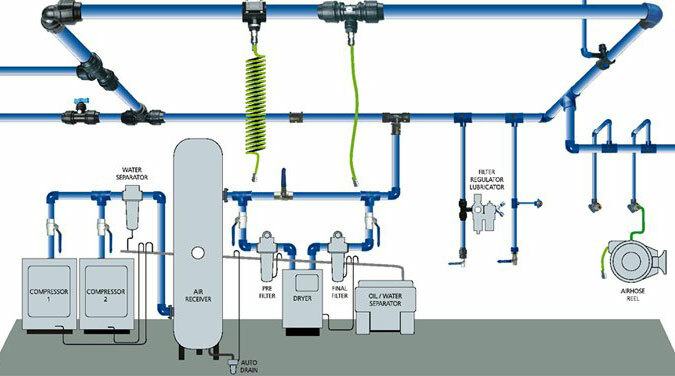 Air compressor systems can – and do – go wrong, whether that be a loss of output or leakages. These faults can account for a significant chunk of wasted energy, and leaving them be is equivalent to pouring money off a cliff. Make sure that your system is properly maintained and is functioning properly.